Each year the Blackdown Community Choir have a concert for family and friends and raise money for a charity of their choice. This year the chosen charity was the Beacon Centre at Musgrove Hospital, as several choir members have recently had need of the centre’s support and care. We performed a wide repertoire of songs including a Spanish lullaby, a carol arranged by the Exmoor Carolers, an African Folk song, a Leadbelly blues number and several songs we had performed at the Song for Water in Bristol in the summer. 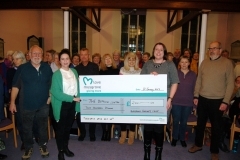 We raised £200 and our choir director Claire Stronach was pleased to present the cheque to Zoe Steer, Head of Fundraising at Musgrove Hospital, at our first session back after the New Year.